Peaceful house in Abjat-sur-Bandiat, Perigord National Park, Dordogne. Suits large families and family groups. Les Vignes is a rambling 18th century Maison Bourgeoise in Abjat-sur-Bandiat, a village in the heart of the wonderful Limousin-Perigord National Park. The paradox of the Perigord-Vert is its sublime anonymity that is largely undiscovered, even by the French. This lovely spacious, 6 bed-roomed property is ideal for family holidays, or an adults' only retreat. With a sunny terrace and pool area, and being located in the heart of the village, it is peaceful and relaxing whilst offering a peek into Dordogne village life. This is one of the village original buildings and has typical french character whilst having been modernised to ensure that your stay is comfortable. There are 6 bedrooms and 5 bathrooms. There is an additional annex bedroom suitable for a young child who needs to sleep close to parents. The house is fully equipped, with the aim of reducing the amount of luggage that you need to bring with you - for example children mugs, plates and cups are provided, there is a cot available and high chair for toddlers. You can fill every day, but of course you are not compelled to go anywhere once you have enjoyed croissant and coffee on the terrace. Simply stay at home, perhaps by the pool, a cool glass of wine on hand and the BBQ ready for use! With 6 rooms, sleeping 13 or more people, Les Vignes is ideal for families, family ‘get-togethers’ or sharing with friends. The rooms are tastefully decorated and all have a dedicated bath or shower room. Rental includes the cost of utilities, towels and bedding. As well as the many activities in the area, we provide a heated pool, a garden area with child's swing and slide, football nets and (of course) the football to play with. There are a variety of indoor games, DVDs and Wii for those who prefer to stay out of the sun and to keep children occupied - though the swimming pool (heated May to October) should be enough of an attraction! The house is very well equipped and homely. Local markets are some of the best, and there's a variety of activities in the area, for those who don't just want to lounge by the pool. The village is in the heart of The Perigord National Park, which gives access to gorgeous woodland walks and bike rides (bike hire available locally), great for wildlife and nature, all starting from the centre, not to mention the great lake swimming just outside of the village, with supervised 'beaches', canoe and pedalo hire and many snack bars. The village has a boulangerie, a bar and a newly opened restaurant (June 2015) along with other amenities. It has a very friendly community. A recent review: The little touches like the wine in the fridge, the red wine and coffee and tea starter pack were very much appreciated. We found the house worked very well for our three families and even on a rainy day we didn't feel like we were under each other's feet. We frequented the Boulanger , the pub and the cafe/restaurant and had a warm welcome at all three. The Saturday music night at the pub was great fun and families were made very welcome. Julie who owns the restaurant was delighted to see us whether we had a quick drink or enjoyed the excellent evening menu. Abjat it self is very pretty and very french which was exactly what we wanted. The surprise of the holiday was that the boats at the local lake were free to use and the facilities such as the play park, snack bars, life guards and very pretty picnic areas were unexpectedly good. The towns and villages nearby were very attractive with plenty to do and Nontron was the best supermarket town which was a short drive away. Wood burner in the sitting room, good supply of wood provided. Broadband wifi, Desktop computer with printer provided. Lounge with dining table, TV with UK freeview channels, Woodburner. DVD. iPod/iPhone docking station Desktop computer with printer. Well equipped large kitchen with cooker, hob, fridge freezer, dishwasher, microwave, plenty of pots, pans, cooking utensils, knives, crockery, cutlery and glasses. Large dining table and chairs. Nearest small golf course is approx. 5 kms at 'Champs Romain'. Popular larger courses approx 45 kms. Ground floor has one small step into the master suite, otherwise access to the rest of the ground floor, pool and gardens is at one level. We booked Les Vignes several months in advance for sharing with several family members as we were all attending a family party in a neighbouring village. On arrival we were pleasantly surprised at how lovely the property was, the pictures were good but did not do the property justice, with it's lovely setting in the village of Abjat. We were met by Dave on behalf of the owners who gave us a tour of the property and highlighted how everything worked. This was especially important as we are part of a large family with varying needs, all of which had been accommodated by the owners when requested in previous months. The kitchen was large and well equipped, the rooms all well furnished, and we were left with ample towels and bed-linen. Outside we benefited from a well maintained and equipped garden, as well as a perfect sized pool for our need. The pool as required by law is equipped with an alarm, and when the battery on this went faulty was speedily changed on call to Dave. The village of Abjat is well positioned to visit many places in the Dordogne and had a restaurant, a bar, a creperie and a boulangerie. The boulangerie had a small stock of grocery supplies but we were not able to purchase general supplies like milk so did need to go to the supermarket several kilometres away. This was not a problem for us as the house was equipped with a spacious fridge freezer and larder. The fridge freezer had an ice and cold water tap, perfect for G&T on the terrace. We were primarily in the Dordogne for a family party but found several places nearby to visit, including the stunning village of Brantome, the village of Nontrom, several markets and several swimming lakes; one of which had a weekly band in the summer as well as an evening food market for drinks and dinner. Overall, we would highly recommend Les Vignes a great place for a large family gathering. We have just returned from an amazing time in this beautiful house. The pictures don't do it justice , we were all blown away on arrival. Large beautifully clean and well equipped property. Outside space wonderful for relaxing and outdoor eating and drinking. Fab house for all those lovely family times for all ages. Great for hide and seek in th e dark !!! House in super sleepy village with all important boulangerie. Pub in village a stones throw and lovely food served. Great time for all , highly recommended. We stayed in this wonderful house for a week in May and had the most amazing holiday. The owners were extremely pleasant and helpful and the house itself was beautiful. It was modern yet rustic, and had a very well equipped kitchen and larder. We made good use of the heated outdoor pool which was kept clean daily, and enjoyed evenings eating out on the terrace every night. The weather was perfect and the surrounding area was stunning. The pub in the village is well worth a visit and the owners are very friendly, and there is a new restaurant which wasn't open until the day after we returned but looked very nice. We would love to return to this lovely house and the surrounding area which had plenty to offer. Thank you for such an enjoyable stay, hope to come back very soon! 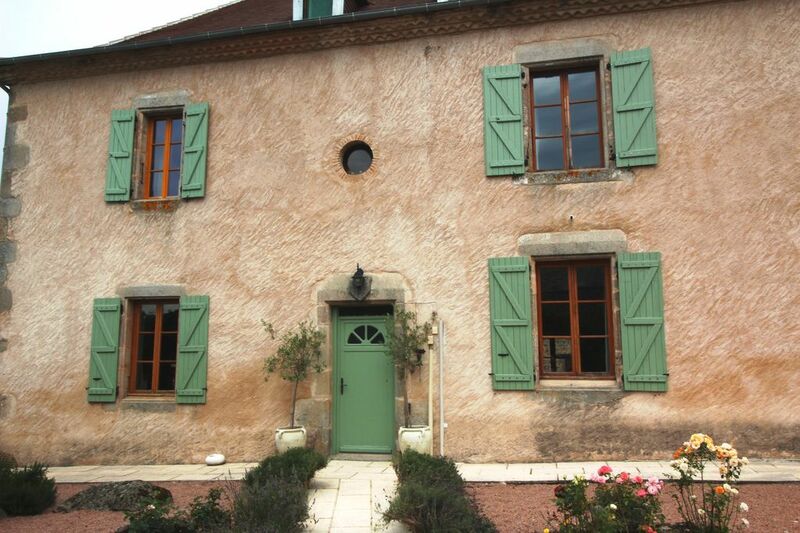 A truly delightful house, beautifully furnished, spacious and very well equipped and with lots of character. Definitely the most comfortable Gite we have rented. We were a three-generation, family-party of nine, including three little ones under five, and the house catered to all our various needs. The pool is safely fenced off, and a real bonus on hot days. You are right in the centre of the pretty village, with the boulangerie a short walk away. There are no further shops in the Abjat, but there is a good supermarket about a ten minute drive away. Sadly, of the two restaurants that were in the village, one has now closed, and the remaining one (Entente Cordiale) has changed hands very recently. The new owners are very welcoming and friendly, but don't go expecting haute cuisine. The surrounding area is very pretty; there are some nice walks. There are a couple of wooded lakes a short drive from the house. You can swim at both of these, and the one near Nontron has a tree-top assault course. Phil, the owner of Les Vignes, could not do enough, both before and during our holiday, to make our stay a success. His local agent, Helen, was also very welcoming and helpful, and all in all we felt very well looked after. Ideal country for walking and cycling. Lakes with 'beaches' and all facilities, approx 5 and 7kms drive. Village centre with all amenities, and local shops, bar and restaurant. Nearest towns with supermarkets and local markets 7kms, and 10 kms. Horseriding, walking, tennis, cycling( bike hire) all in the village. Lake swimming 5 and 7 kms. Canoeing, acrobois, velorail, chateaux, caves, Karting, Golf all within a short distance. Restaurants and local markets in abundance. Booking Notes: Email for booking. Non refundable deposit at time of booking is 25%. Balance to be paid 2 month prior to arrival. A £200 returnable 'breakages and cleaning' deposit is taken prior to arrival, and returned after end of holiday inspection (subject to conditions). Changeover Day: Preferred changeover day is Saturday, though this is negotiable. Minimum stay for whole house rental is 5 days, although summer rentals will normally only be Saturday to Saturday. Notes on prices: Please contact me for early 'deals' on listed prices.